As we saw in our first round of benchmarks, the new Mac Pro is more of a specialized workstation than a general purpose computer. In fact, unless you're using a pro app that takes advantage of multiple processing cores, a tricked-out iMac may outperform the new Mac Pro. For this round of testing we wanted to see how upgrading our 2012 Mac Pros would help close the performance gap with the new Mac Pro. We started with our stock 2012 quad-core and dual six-core (12 cores total) Mac Pros and upgraded them with fast flash storage via OWC's Mercury Accelsior E2 PCIe SSD ($630), 32GB of RAM from Crucial, and faster Sapphire HD 7950 Mac Edition ($500) graphics. The stock 2012 quad-core 3.2GHz Mac Pro with a 1TB hard drive, 6GB of RAM, and Radeon HD5770 graphics earned a Speedmark 9 score of 171. After upgrading, the same system scored a 241, 41 percent higher than the stock system. As you might expect, the processor-intensive tests didn't show much difference after the upgrades, but folder copy and uncompressing tests were much, much faster with the addition of the Accelsior solid-state storage. The upgraded 3.2GHz quad-core Mac Pro was able to copy a 6GB folder from one part of the drive to another in less than one-fifth of the time of the stock model. The Heaven and Valley benchmarks showed the Sapphire card installed in the upgraded Mac Pros able to display twice the number of frames per second as the Radeon HD5770 the systems shipped with. 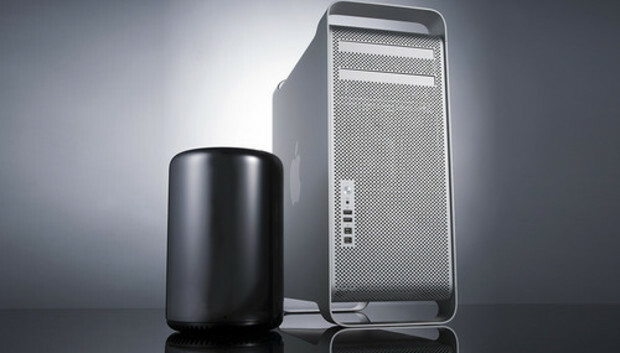 Despite the performance gains, the new Mac Pro was 45 percent faster overall than the upgraded quad-core 2012 Mac Pro. Upgrading the 12-core 2012 Mac Pro raised the Speedmark 9 score by a healthy 31 percent, though the new 8-core Mac Pro was still 37 percent faster overall than the updated 12-core model. We also ran a new Photoshop action script made up of tasks that take advantage of hardware acceleration. The beefed-up 2012 quad-core Mac Pro was 31 percent faster than the stock model, but the new Mac Pro was still faster--22 percent faster-- than upgraded 2012 Mac Pro. Our CTO 2013 27-inch iMac scored similarly to the upgraded 12-core 2012 Mac Pro in this test. In our Final Cut Pro X tests, the new Mac Pro to significantly outperforms the stock 2012 Mac Pros, but the upgrades do help the older machines. On a stock quad-core 2012 Mac Pro, an import time in Final Cut Pro X went from 131 seconds to just 26 seconds. The stock Mac Pros took twice as long to render our test Final Cut Pro X project as the CTO iMac. After the upgrades, the 12-core rendered the job 25 percent faster than the CTO iMac, but the quad-core was still 25 percent slower than the CTO iMac. We substantially increased the Final Cut Pro X project length to see how the new Mac Pro fared under a more sustained load. We took 30 minutes of 4K video and applied a variety of effects to the footage and then rendered the project. The stock 2012 quad-core Mac Pro took over 70 minutes to process the clip. After upgrading, the quad-core Mac Pro knocked 18 minutes off the time. The stock 2012 12-core Mac Pro took just over 64 minutes to finish our longer Final Cut Pro test; after upgrades it took about 39 minutes. The upgraded 12-core rendered the project in about the same amount of time as the CTO iMac. The new Mac Pro finished first yet again, taking just 25 minutes to render the project, 36 percent faster than the upgraded 12-core 2012 Mac Pro. Several readers asked us to run an Xcode project on the new Mac Pro to see how well it fared. We cloned the code repository for OpenEMU onto our Mac Pros and CTO iMac and used the Xcode command line tools to build the project on each system. The test is CPU-intensive. The upgrades to the Mac Pros made little difference in the amount of time that it took to build the project. The new Mac Pro took 151 seconds to complete the task, 43 percent faster than the upgraded 2012 12-core Mac Pro and 46 percent faster than the upgraded 2012 quad-core Mac Pro. The 2013 Mac Pro was also faster than our CTO 2013 iMac, but only by 16 percent.